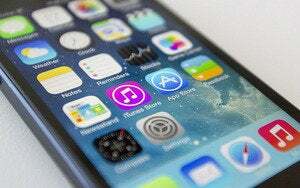 Whether it’s the first time you’ve picked up an iPad or the seventeenth time you’ve pulled out your iPhone today, there are probably still some iOS 7 features and functionality that you’re not familiar with. Don’t sweat it: We’re here to help. We’ve collected some of our favorite and most useful tips and compiled them here, just for you. 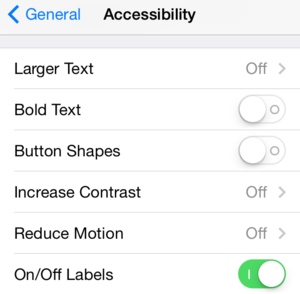 There are several settings you can change to make iOS 7 easier on the eyes. 2. 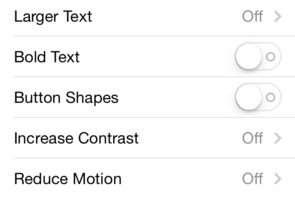 Buttons, buttons, everywhere: iOS 7 has ditched most of the traditional buttons present in past versions of Apple’s mobile software, but if you’re jonesing for that old familiar arrow shape, you can enable it via Settings > General > Accessibility > Button Shapes. 3. Contrast is key: Some of us like white text on light backgrounds, but others find it causes headaches and hurts their eyes. If you’re part of that latter group, there are several options for your viewing pleasure under Settings > General > Accessibility > Increase Contrast. If you want to increase the text and background contrast for features like Control Center and Notification Center, turn on the Reduce Transparency option. If you wish to darken the highlight colors found in an app’s menu and tab bar (the pink color of the Music app, for instance), toggle the Darken Colors switch. And if you’d like to darken the white backgrounds found in apps like Settings, the Reduce White Point screen brings the pure white coloration down to a more ocularly-friendly light grey. 4. Turn-by-turn walking directions: We’ve long had the ability to do turn-by-turn directions for driving, but iOS 7 also adds the ability to get those same prompted directions when you’re on foot. Just tap the Directions button in the top left hand corner, select the Walking icon at the top of the screen, enter your destination, and tap Route. 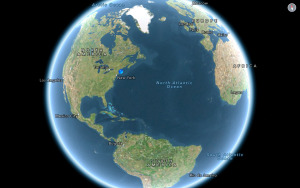 Siri will guide you to your destination, alerting you by voice when it’s time to make a turn. 5. Prefer walking directions: Say you’re on vacation and don’t have a car: Wouldn’t it be useful if you didn’t have to remind Maps that you want those walking directions every time you put in a location? Easy enough: Just go to Settings > Maps and scroll down to the Preferred Directions section. There you’ll be able to choose between Driving and Walking. Now, when you launch Maps, it’ll give you pedestrian-friendly directions by default. Apple's free Find My Friends app lets you set geofences on friends so you can be notified when they leave or arrive at a location. 6. Notify you about your friends’ location: Apple’s free Find My Friends app can be super useful at times, such as when you’re meeting up with a friend. You can even use the app to automatically tell your friend when you’re heading out—or be notified when your friend is arriving someplace—all thanks to geofences. Just launch the Find My Friends app, select the friend you want to be notified about and tap the More… button in the toolbar. At the bottom of the contact card, choose either Notify Me or Notify [your friend’s name]. You’ll be prompted to choose whether the notification will show up when you arrive at or leave a place, as well as specifying the location (and even how big a radius from that location will trigger the notification). If you choose to notify your friend about your location, you can also send a message immediately. 8. Geofencing in Reminders: Not only can you can set geofences on people, you can also place them on locations. 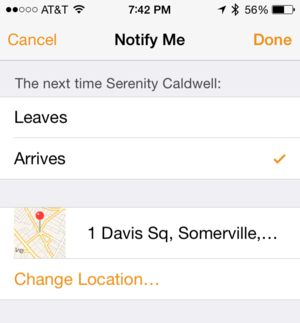 Using the Reminders app, you can have a notification sent to you when you’re arriving at or leaving a location. Just create a reminder, tap the ‘i’ button next to it, and choose “Remind me at a location.” Under the Location sub-menu, search for a contact, place name, or specific address; as with Find My Friends, you can even specify the size of the radius around the location, just in case you want to be reminded to get cookies when you’re even remotely near the supermarket. Accidentally take 88 burst mode photos when one or two would do fine? You can weed them out in the Camera Roll. 9. Save your favorite Burst Mode images (iPhone 5s): The iPhone 5s’s Burst Mode is an excellent way to ensure that you capture fast-moving action, but you also don’t want to take up lots of space with photo duplicates. After you’ve captured an image in Burst Mode by pressing and holding down the shutter button for a few seconds, you can tap the Camera Roll to view your images. 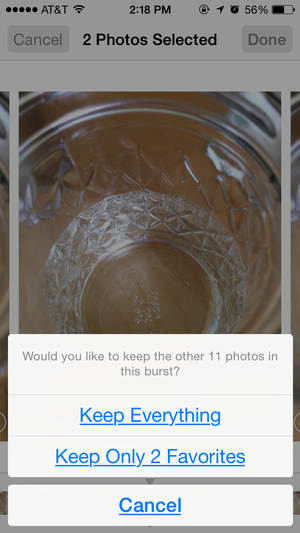 Your burst appears as a single photo in the album, represented by what iOS 7 thinks is the best photo of the bunch. You can go back and look through the full burst collection, however, by tapping the Favorites button; select the photo (or photos) you’d like to showcase by tapping on them and pressing Done. From there, you can choose to keep the entire burst for future perusal, or delete all the images you chose not to select. 10. Enable automatic HDR (iPhone 5s): Back in 2010, iOS 4.1 added the High Dynamic Range (HDR) feature to its Camera app, which allowed you to take a photo of a subject with both sharp light and deep shadow and have it render as evenly lit. But HDR took longer to shoot than the average image, which for most people meant manually turning it on whenever you wanted to capture that perfect sunset. 11. Put permanent filters on your camera: Both the iPhone and iPad offer front and back hardware cameras, and on the software side, fun filters for Photo and Square modes to make your pictures more interesting. If you like having a specific filter on images, you can set either Square or Photo mode to always launch with the image manipulation of your choice. Personally, I have iOS 7’s Square mode set to the Noir filter, as I like Apple’s black and white correction more than, say, Instagram’s. To set the filter, all you have to do is tap the Filter button in the Camera app while in the mode of your choice. Switch to another mode and you’ll once again have a clean slate, but return to your original mode and your filter of choice remains. 12. Share your Photo Stream with others (and let them add images, too): When Shared Photo Streams first launched with iOS 6, they let you share groups of images with any of your friends for liking and comments, but your buddies couldn’t add images or video of their own. 13. Use iMovie to create slo-mo clips: iPhone 5s owners can make slow-motion clips to their heart’s content thanks to iOS 7’s 120FPS slo-mo mode in the Camera app. 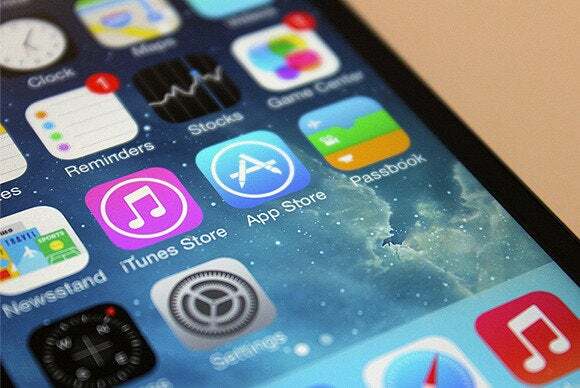 But older iPhone owners can get in on some of that fun, too—they just need to download iMovie. After you’ve filmed something, open iMovie and create a new project with your clip. Next, separate your clip into three segments by swiping down on the film strip: the intro normal-speed segment, a slow-motion segment, and the ending normal-speed segment. Finally, tap on the middle segment, choose Speed, and drag the slider toward the Tortoise icon. Voilà: easy in-and-out slow-motion. You can see a list of all the numbers and contacts you've blocked in Settings > Phone > Blocked. 14. 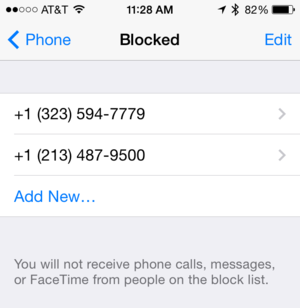 Block annoying calls: We haven’t solved the problem of email spam, but telemarketing can be slightly less annoying with a new feature of iOS 7: call blocking. You can choose to not receive calls from a specific number or contact by tapping the ‘i’ button next to that entry in the Recents or Voicemail sections of the Phone app, scrolling down, and choosing Block this Caller. (It also works on any contact card in the Phone or Contacts app.) Note that by doing so you also won’t receive text messages/iMessages or FaceTime calls from that number or contact. If you’ve blocked someone in error, you can edit the no-call list under Settings > Phone > Blocked. 15. Make FaceTime Audio calls for cheap: Calling plans are pretty cheap these days, but if you’re looking to pare down, you can make FaceTime Audio calls over Wi-Fi or cellular data networks. Just make sure you’ve enabled FaceTime in the Settings app, then find an entry in the Contacts or Phone app and tap the phone icon next to FaceTime. You’ll immediately launch into an audio-only FaceTime call, though you can switch over to a video call at any point by tapping the FaceTime button. You can even add a FaceTime Audio call to your Phone app’s Favorites by tapping Add to Favorite on any contact card, and then selecting FaceTime Audio. 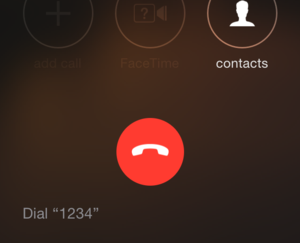 Adding a conference code or extension to a number lets you dial it automatically just by tapping the button that appears in the bottom left. 16. Enter a phone conference code at a tap: Many of us have had to dial either hard-to-remember extensions or conference room codes at some point. If you find yourself making those calls frequently, you can simplify the process. Go to the Keypad section of the Phone app and enter the phone number you dial; then, at the end, tap and hold the pound key until it turns into a semicolon. Now enter the passcode or extension, and then add the whole shebang to a new or existing contact record. Next time you dial that contact or number, you’ll see a small button in the bottom left that says “Dial” with the code you entered; tap that to have it entered on the keypad automatically. 17. Speak your settings: Siri’s become a bit smarter across the board in iOS 7, and one of those IQ improvements deals with controlling your settings. You can ask Siri to turn Bluetooth on or off, open a specific Settings pane, and even turn on Airplane Mode—though Apple’s voice assistant gets a little snarky if you ask for that last one. There's lots to talk to Siri about in iOS 7. 18. Make Siri better understand your friends’ names: If you heard it spoken out loud, my little sister’s name is a pretty standard one—“Caitlin.” Unfortunately, that’s not how my parents chose to spell it; instead, her contact card reads “Caetlyn.” In iOS 6, Siri had a bit of trouble with that, expecting me to either pronounce her name “Keet-lan” or use the nickname I’d given her. Thanks to Siri’s new pronunciation engine, though, my phone can be a little smarter about her contact card—along with any of yours. Just say “Learn how to pronounce [name]’s name” and Siri will comply, first asking you for your pronunciation of the first and last name, then providing you with several pronunciation options. Siri may be there for us, but sometimes, she’s just not listening as closely as she should be. If you have iOS 7.1 installed, however, you can hold down the Home button to make Siri listen as long as you like—she won’t stop until you lift your finger. Helpful for recording the entirety of messages and reminders; even more helpful when you just need someone to talk to—even if that someone is digital. From Safari’s Settings you can assign any folder from your bookmarks as Favorites, which show up when you load a blank tab. 20. 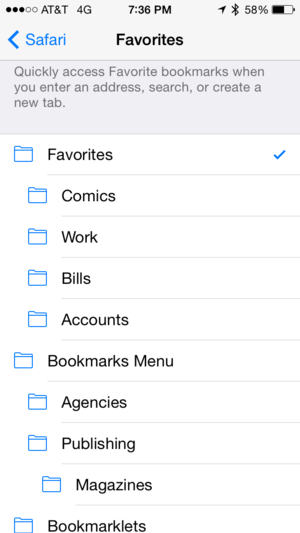 Playing Favorites: In iOS 7 there’s a new bookmarks section called Favorites; on the iPad, this is used to populate the Favorites Bar in Safari, but on both the iPad and iPhone, it also determines which bookmarks pop up when you’re in a blank tab. You can make Favorites work for you by going to Settings > Safari > Favorites, where you can select any folder in your Bookmarks as your Favorites. Now when you open a blank tab in Safari, you’ll see those specific sites are just a tap away.